ATLANTA NETWORK SYSTEMS (ANS) is a nationally recognized leader in the management of installation and maintenance of Business Satellite Television, VSAT Systems, Digital Signage, Display, Voip, Structured Cabling, and Large Scale Satellite Antenna Installations throughout the United States. ANS has developed a number of long-term strategic relationships with major systems integrators in the industry such as Electronic Data Systems (EDS), JCPenney, Hughes Network Systems and Scientific-Atlanta. These companies have been able to rely upon ANS to manage the installation and maintenance of their networks, allowing them to concentrate on serving the needs of their customers. Likewise, ANS has successfully installed networks for many major companies and government agencies such as Transportation Security Administration ( TSA ), Eckerd Drugs, Social Security Administration, Veterans Administration, Internal Revenue Service, NIMA, Indian Health Services, E.D. Jones, etc. Over the years, the industry has changed dramatically. Systems have become far more sophisticated, requiring technicians who are skilled in a variety of electronic, computer and engineering disciplines. Vastly increased competition has arisen in the form of the Internet and other alternative methods of providing information. As a result, ANS and its strategic partners are under constant pressure to streamline operations and provide services far more economically, while developing continually greater levels of expertise with an expanding need for phone techs, satellite techs, electricians, display techs and A/V techs. In order to meet this challenging task, ANS has established a network of more than 500 highly trained local and regional contractors in all 50 states and selected foreign locations. The relationship that ANS has developed with these contractors is not the traditional between a prime contractor and subcontractors, but is more akin to an ongoing, expanding partnership. Many of these contractors have worked with ANS since its inception. These contractors are business leaders in their communities, and have invaluable knowledge regarding the best methods of performing the necessary work in their own regions of the country. These contractors, although independent businesses, have always given ANS their first priority in assigning technicians and scheduling work. 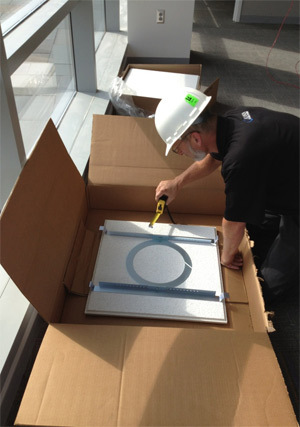 In addition, ANS has a number of crews of highly trained technicians throughout the Eastern United States. This combination of contractors and in-house crews allows ANS to meet the manpower needs of any planned rollout, and to have trained technicians available to cover even the most remote regions of the United States. Over the years, ANS customers have publically recognized and applauded the quality of our work. The United States Postal Service has presented ANS with an award for outstanding quality in the performance of installations for its VSAT network. ANS was recognized, out of over 20 local, regional and national contractors working on the USPS project, for the continued superior quality of its installations. Hughes Network Systems has honored ANS with the awards of excellence Gold Club for Inventory Control, Superior Technician, Service Excellence and DM Excellence. The industry has shown astonishing growth in the past decade. The continued trend toward smaller, more sophisticated equipment gives every indication that this growth will expand well into the future. Atlanta Network Systems will also continue to ensure that its customers can take full advantage of this state-of-the-art equipment with the confidence that, no matter how extensive or sophisticated the network, all systems will be installed and maintained safely, expeditiously and economically.